The brand new Concours of Elegance website not only provides essential information to all participants and visitors about the 2014 event, but it also whets the appetite for September’s event, conveying much of the elegance, style and passion that makes the Concours of Elegance an unmissable occasion for all discerning motor car enthusiasts. The new website includes a flavour of just some of the 60 exceptional rare and exclusive Concours cars, painstakingly selected by the event’s panel of automotive experts. As a taster, for 2014 these will include a brace of significant pre-war Mercedes-Benz models, to be joined at Hampton Court Palace by an imposing 1912 Rolls-Royce Silver Ghost Baker Tourer, a 1932 Bugatti Type 55 Figoni et Falaschi Roadster, a 1957 Ferrari 250 Tour de France Scaglietti Corsa Berlinetta, Pininfarina’s one-off 1960 Alfa Romeo Superflow IV Coupe, a scarce mid-engined 1970 AMC AMX/3 and the 1986 Monte Carlo Rally-winning Lancia Delta S4. Supporting the main hand-picked 60-Concours entries will be a display of over 350 other desirable cars from all eras within the Hampton Court Palace grounds on the Saturday and Sunday, presented by a wide variety of car clubs, exclusive Concours classic car tours, and prestige motor vehicle manufacturers. Information on these, plus event partners, chosen charities and entertaining opportunities at the Concours – with tailor-made hospitality and picnicking packages – are detailed in the new Concours of Elegance website. 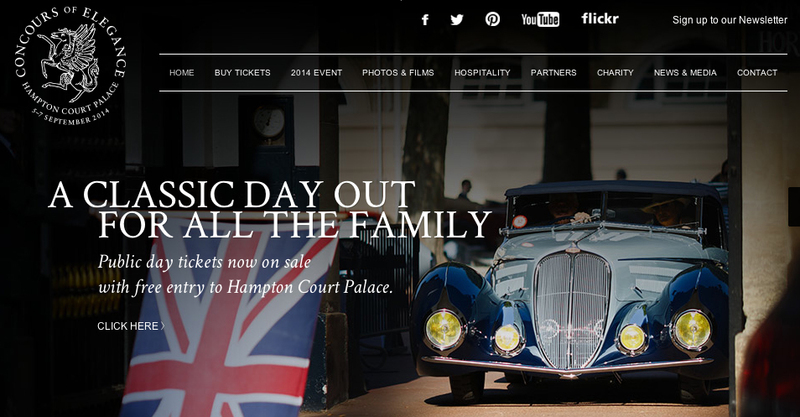 The website also includes an easy click-through link to purchase tickets to the 2014 Concours – which includes free entry into Hampton Court Palace – plus details of the stunning Palace venue itself. Videos and an image gallery of the previous Concours of Elegance events at Windsor Castle and St James’s Palace can also be viewed to revive memories of these exceptional, award-winning occasions. A dedicated Media area, for the exclusive use of the press only, has also been set-up for media accreditation applications and the latest Concours news updates. The 2014 Concours of Elegance at Hampton Court Palace will be open to the public on Saturday 6 September and Sunday 7 September, with adult entry tickets, event merchandise and hospitality available to purchase on-line now from £25 per person, per day.